Airforce Terralift® is the largest of the Terrain Aeration fleet and is currently the longest serving machine. At 1.2 tonnes Airforce Terralift® is also the largest and heaviest machine making it ideal to use on football, rugby, and cricket outfields, and any other large large areas of turf where speed of operation is important. Airforce is a four wheeled drive on machine and is the largest and fastest of our Airforce fleet and requires a minimum access of 1400mm or four feet eight inches. 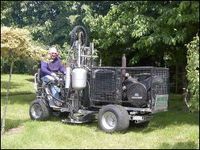 Whilst the machine has been used on fine turf such as bowls and golf greens, it is not the machine of choice for fine turf treatment.